These days, if you’re rocking a stainless steel cooler (or any other sort of metal cooler), we’ll take a stab in the dark and guess that you’re a character of style and intention – and we can certainly appreciate that. Unfortunately, outside of the antique business (think of good old Coke coolers or Corona coolers) you just don’t see a huge market for classic metal coolers these days, and it’s a shame. We suppose it’s fair enough, though, given the vast price difference between metal and plastic, but nevertheless we’d still like to see more people and more manufacturers dish out some cool, stylish metal coolers. After all, they’re functional, they perform well, they’re super durable, and they just flat-out look good. In this review, we’ll take an in-depth look at several of our personal favorite stainless steel coolers that are currently being manufactured today. These are some of the best metal coolers out there – some of them we choose for performance, some for their price/value, and others for just pure style and aesthetics. One thing is certain though no matter which one you choose: steel will never, ever go out of style. This Coleman 54-quart steel cooler is the most popular contemporary steel cooler available today – it boasts a nice combination of value, construction, and timeless old-school style. Also, with (six different color options available, you’ll find a variety of styles to satisfy your range of aesthetic desires. We will say one negative thing though; the construction of this cooler doesn’t really live up to the standards of the original Coleman steel ice chests, which were truly full-on metal brutes. 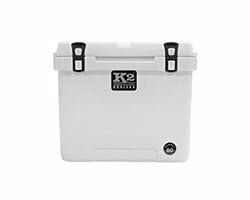 These newer generation coolers incorporate quite a lot of heavy-duty plastic over the steel core of the lid and body. Not really a bad thing, as the tough PVE adds durability and rust protection, but to some of the purists out there it may be a put-off. 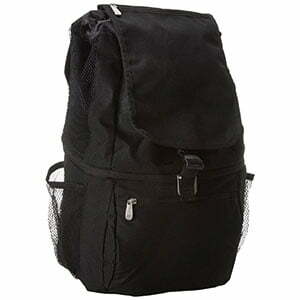 The price tag, though, at under $100 is quite reasonable considering it’s a heavy-duty, steel-cored cooler. The Coleman 54-quart measures about 25” x 17” x 17”, and can hold up to 85 12-oz cans, with ice. As far as performance (keep in mind that these coolers are more style/statement pieces than true performers) they’re not really up to par with the premium rotomolded designs that’ll hold ice for days on end. That being said, considering the price tag (drastically cheaper than a premium rotomold), a good steel cooler like this Coleman Steel Belted is a decent intermediate option between an expensive high-performance cooler and a cheap, basic cooler – expect ice to hold for about half a day under normal conditions before starting to melt. Check out 54Q Coleman Steel Belted on Amazon right here. The Igloo 54-quart Stainless Steel Cooler is a modern day reincarnation of a true classic; it performs well, looks sleek, and will last for decades. 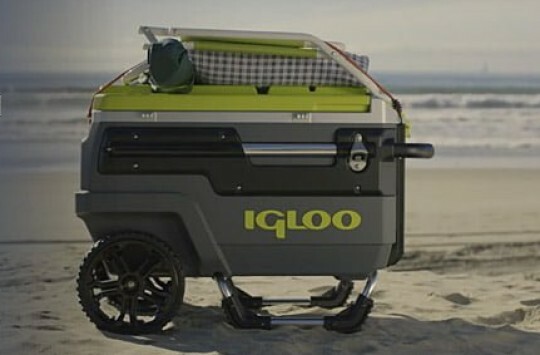 Although it has the same internal 54-quart capacity, the Igloo is just a tad smaller than the Coleman at 24.45” x 16.45” x 15.87. Overall, though, it incorporates a higher volume of steel and generally seems to be constructed a bit better. At nearly double the price, though, that should be expected. The product details claim that this cooler holds ice for 4 days. While that may be true under ideal circumstances (i.e. in the shade in 50-degree weather), don’tt expect that to be the case under typical summertime conditions. At most, the Igloo stainless steel will hold ice for a day and a half or so before it really starts to melt. Definitely not a bad option for a cool, stylish, traditional metal ice chest – and probably the best performing one on the list. The Corona CORIC-54 is a super stylish novelty piece that just so happens to double as a high quality, well-functioning performance cooler. A lot of times, people are stuck with compromising performance when purchasing super-specific branded novelty pieces like these. However, the CORIC-54 stainless steel ice chest is constructed with functionality in mind first, and aesthetics second. That being said, this traditionally-designed metal cooler will be certain to turn a few heads and add some legit style points to your summertime fiesta or backyard gathering. At 25.5” x 16.2” x 16.8”, the CORIC-54 will hold 85 12-oz cans with ease. Good luck lifting it by yourself, though, when it’s loaded to capacity with ice and drinks. TIP: We recently published a dedicated post covering Corona coolers, right here. This is probably our favorite cooler/ice chest on the list – we love the quality build, looks, and maneuverability/multi-functionality that the rolling cart and bottom storage shelf offers. In a lot of ways this might be the ultimate backyard cooler – it looks good enough to be a permanent fixture on your outdoor patio/deck area, and it’ll act as a fantastic compliment to a quality stainless steel outdoor grill. Have some friends over, and it’ll be clear that you know how to lounge around and BBQ in style. At 80-quarts, the ice cart is designed to hold enough beverages for an entire backyard crowd. The wheels are 2” x 1”, and two of them lock in place so you don’t have to worry about the unit being unstable under a full load. A couple other functional features include a built-in bottle opener/cap catcher, drainage plug for easy cleanup, and a hinged double sided lid for easy access without having to open the whole unit. The TXK-0802 is constructed with high-grade 304 stainless steel, and the bronze speckled finish on the lid and legs adds just a little extra hint of flair and style. Overall, a super nice-looking permanent-fixture backyard cooler that we highly recommend. Find out more details and pictures on this Amazon page. 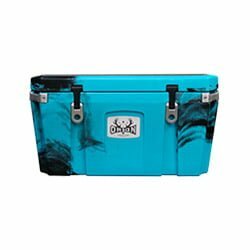 This is the ultimate manly man’s cooler; perhaps no other material screams masculinity more so than diamond plate. And to our knowledge, the Lund 4400 is the only diamond plate metal cooler on the market, constructed with 0.06” rust-resistant aluminum. For those in the know, the Lund brand is already a well-established manufacturer of high quality aluminum fishing boats, so you can be rest assured that the quality of this cooler will be nothing short of excellent. 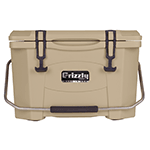 As far as size, the 12-gallon cooler runs at 25.5” x 21” x 13” – essentially the same size as the other coolers on this list. It’s a bit pricey (here’s an Amazon listing), but we’ll be frank and say that the majority of what you’re paying for is the expensive diamond plate. However, it’s expensive for good reason: incredibly tough, weather-resistant, and solid as a rock. 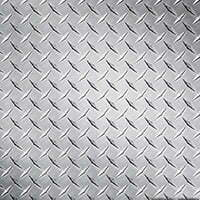 I mean come one, it’s diamond plate. If you’re a statement-maker, or if you’re just looking for the absolute perfect tailgating cooler to compliment your pickup truck and it’s massive diamond plate tool box, this is the one. 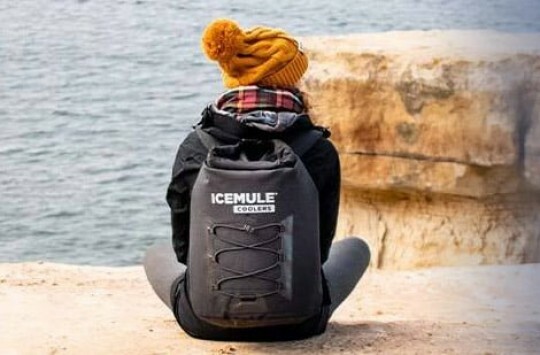 It performs well to boot, too – expect it to hold ice easily for an entire day’s activities – probably more depending on the heat/intensity of the conditions. The bottom line is that these traditionally-designed metal coolers and metal ice chests are super cool statement pieces that are tough as nails, and perform well. We mentioned it earlier in the article that you might consider a quality stainless steel cooler to be a good intermediate (value and performance-wise) between a basic, entry-level plastic cooler and a premium, high-performance rotomolded cooler like Orca or Yeti, or any of those. However, there’s just something about the timeless style of a traditional metal cooler – no matter how you look at it, there’s just no substitute. 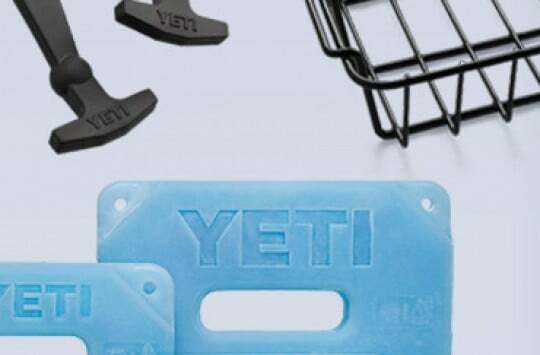 You’ll find more metal coolers on Amazon, here’s a link to other related listings.